If you’re in marketing then you know that content is king. Keeping your online presence up-to-date with relevant and fresh content shows search engines and directories that your business is active and therefore you rank higher. Oftentimes multi-location brands forget that unique local content is just as important as national content. In order to help you create relevant local content, we’ve gathered 7 examples of local content that any brand can recreate. Before we get into what local content you can create let’s discuss where you can share all of your content. 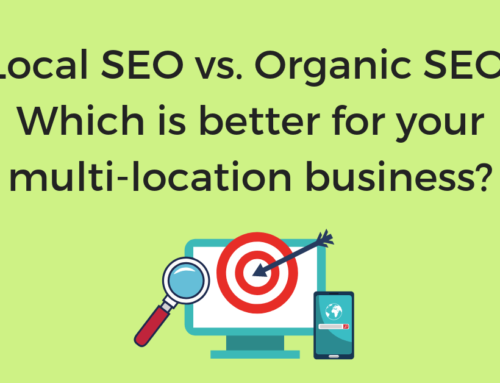 When it comes to a multi-location business it’s just as important to share locally as it is nationally. 1. On your local pages – Your local landing pages are the perfect place to share your local content. Consumers are already going there to find location-specific information. You can even connect your social media apps to make sharing to these pages even easier. 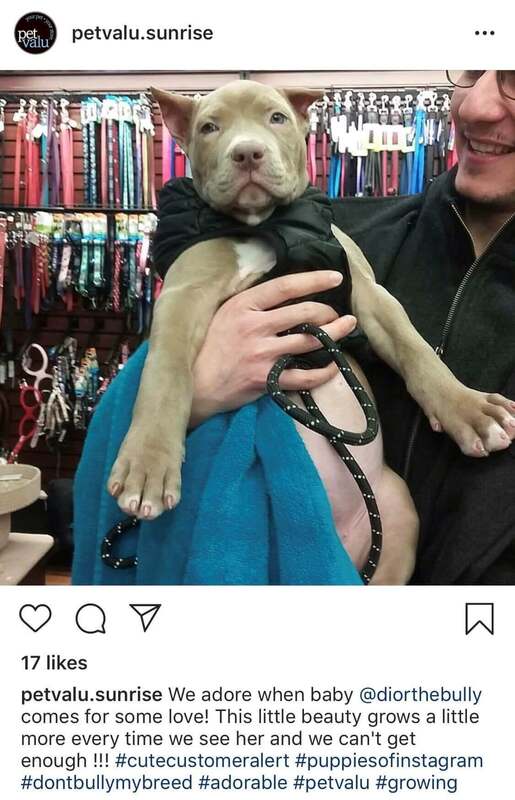 Pet Valu’s local page with an event board. 2. 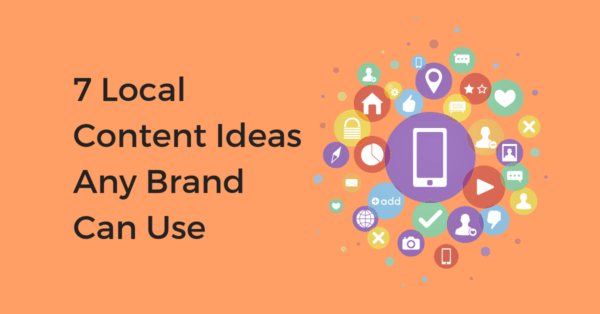 On your website – It doesn’t matter if your content is local-focused or brand-wide, sharing content on your brand’s website is always a good idea. Have a great story to tell about a specific location? Post it on your blog, even if it’s tied to a specific location, good stories deserve to be shared! 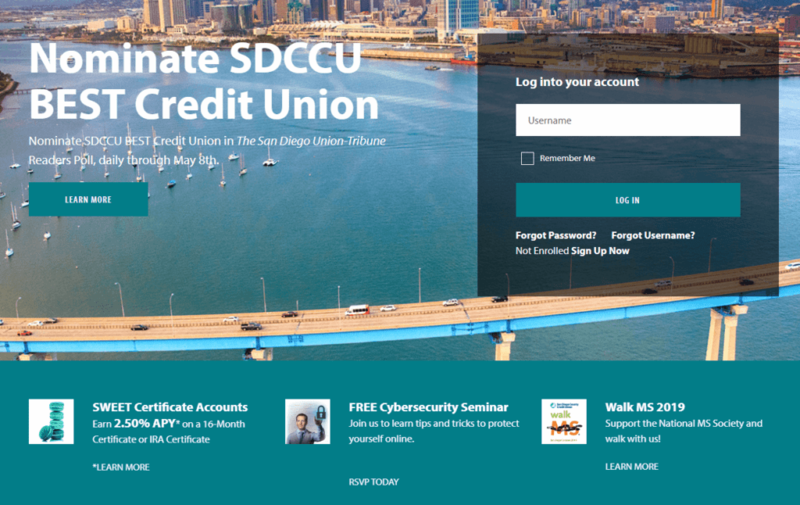 SDCCU promoting their free seminar and MS Walk events. 3. On your social media pages (Facebook, Instagram, Twitter, Snapchat, etc.) – If you have not yet set up local social media pages, now is the perfect time to start. 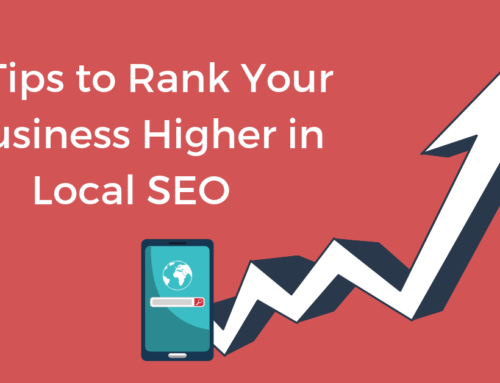 Local social media pages make it much easier to get the right content in front of your most loyal fans. 4. Google Posts – Unlike social media, Google Posts get content in front of people who are looking to visit your store the same day or week. Google Posts are especially great for posting about upcoming events. 5. On your listings – Don’t forget to share content on your listings as well. This goes beyond just Facebook and Google Posts. You can repurpose photos and videos by adding them to your listings. 6. In-Store – Don’t forget to post your content in-store. Even if you ask people to go online to learn more, promoting your content in-store is essential for those loyal customers who may not be actively searching for your business online. One of the best ways to get the community engaged with your business is to host or sponsor a local event. 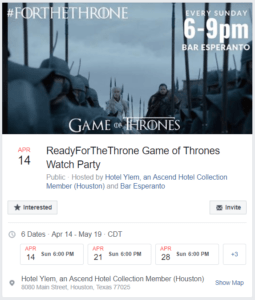 For example, hotel Yelm in Houston is hosting a weekly Game of Thrones watch party. Not only is this a good way to engage with the local community but it’s a great way to give guests a unique experience they won’t forget. This helps to make booking another room from this brand in the future an easy choice. Every company should be giving back to their community. No matter if you’re a financial institution, law firm, movie theater, pest control or even a software company sharing your experience of community outreach is always a good idea. Not only does giving back to your community do good, but it can help to spread the word about your brand. 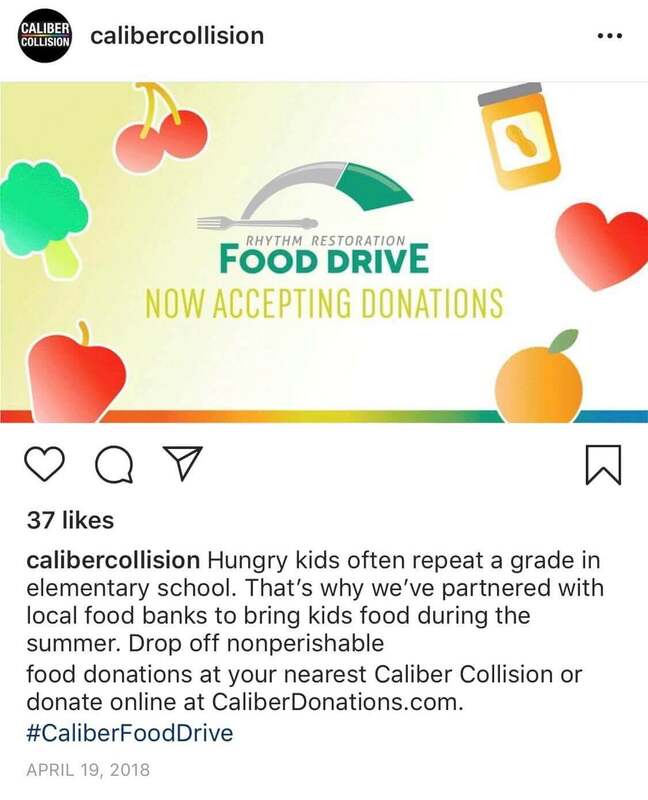 One of our favorite examples of this is Caliber Collision’s current campaign to fight child hunger over summer. They’re hosting a food drive and accepting donations at all of their locations. Why is this campaign so great besides the fact that they’re feeding children in need? By asking people to drop off food donations it helps familiarize people with the Caliber Collision location nearest them. As a collision repair center, most people might not be aware of the brand or their locations until they need them. This campaign helps remind past and future customers that the brand is there when they need them. As Caliber Collision continues to expand its footprint with its recent acquisition of another 1,000 location collision center, this drive can help to raise awareness of their new locations as well. It’s a win-win for the brand, they get to make an impact in fighting child hunger and raise awareness about their locations at the same time. This one is probably the easiest to achieve. Simply let people know of your ongoing promotions in an effort to create more in-store foot traffic. Whether it’s a brand-wide campaign or a promotion for a single location only, this type of content is always easy to share. Make sure to include some captivating visuals and share them everywhere you can. The Melting Pot in Downtown San Diego is a great example of this. They used Google Posts to share their “Kids Eat Free” promotion last August. This specific promotion is a great way to entice more families to dine with them. Creating local content can be as simple as introducing your team members to consumers. The customer experience at multi-location brands can sometimes feel impersonal. Share how great your employees are and help to foster a better relationship between customers and staff. Starbucks has over 28,000 locations and yet the customer experience feels more personal than other retail businesses. Maybe it’s that they ask for your name or that we frequent the same location often but the experience isn’t one-sided. 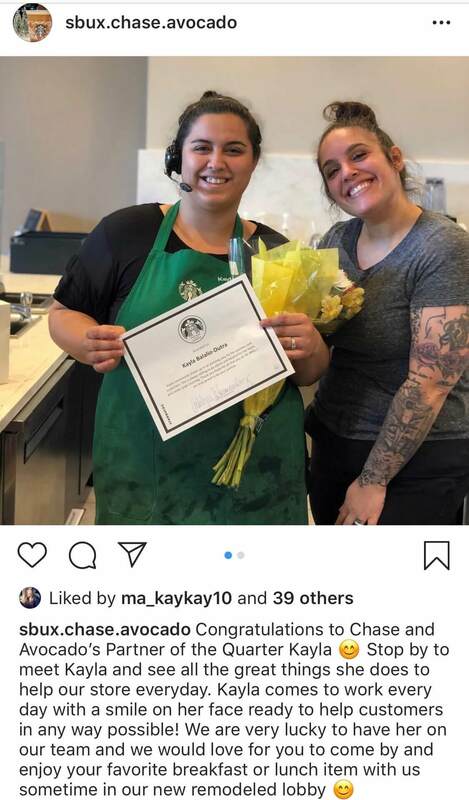 As seen in the Instagram post below, Starbucks locations do a great job of breaking down the walls between customer and employee. Share team member accomplishments, stories, testimonials, and more. It’s something both the customer and your employees will appreciate. Constantly creating new content is not easy. You want to keep your content fresh and post often but it’s easier said than done, especially if you have 100s of locations. So why not rely on customer-generated content to help fill in the gaps between the content you create. With social media, it’s so easy to repost content from your biggest fans. Reposting content encourages fans to post more about your brand and shows consumers that you see your customers and how they interact with your brand. Make sure you always give credit to the owner of the photo and only repost public content. If you’re unsure if the photo is ok to share on your brand social media pages, it never hurts to ask. A great example of this is PODS. 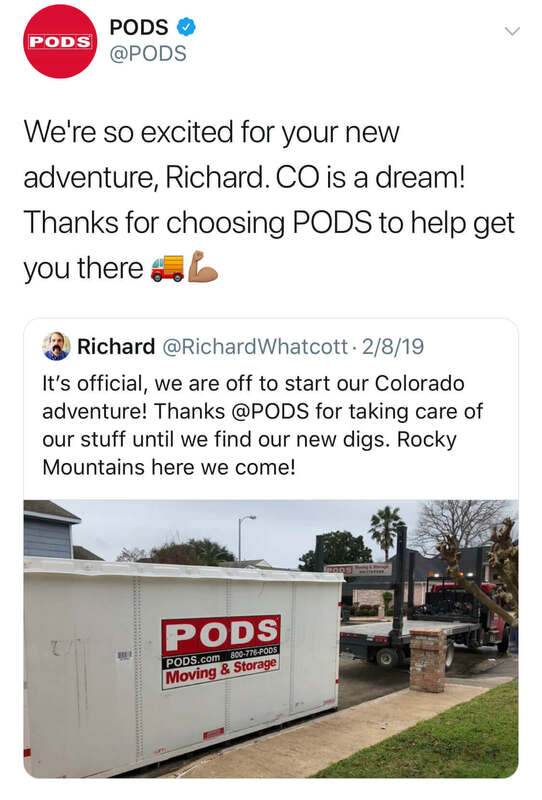 A customer shared their positive experience moving states with PODS and PODS went ahead and re-tweeted the photo on their national twitter page. Another great way to show customers you appreciate them is by doing customer shoutouts. Have a regular or a customer who happened to brighten your day? Share that! Customer appreciation posts make your customers feel valued and make it even easier for them to want to frequent your store. Again, don’t forget to ask permission before taking any customer photos. 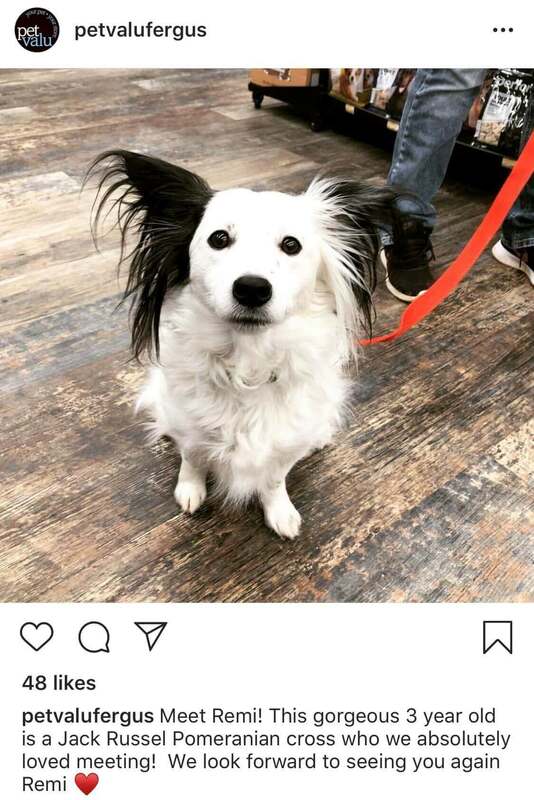 The best (and cutest) example of this is Pet Valu’s customer appreciation posts. 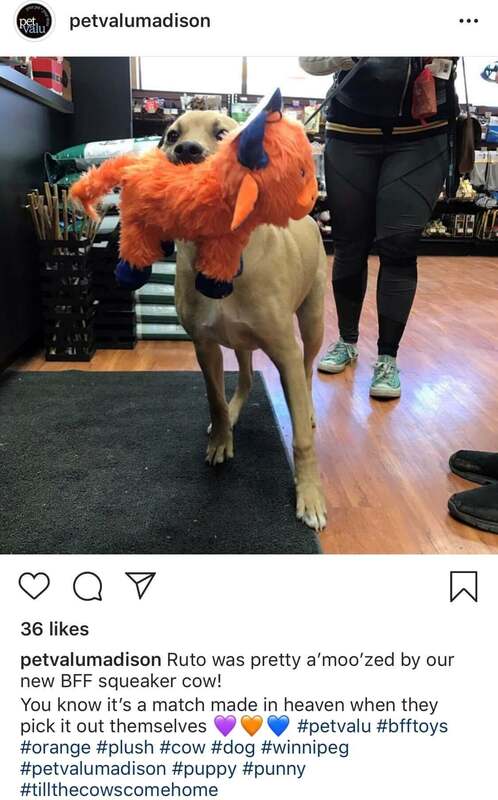 Not only do they do it at a national level but at the local level on every one of their local Instagram business pages. 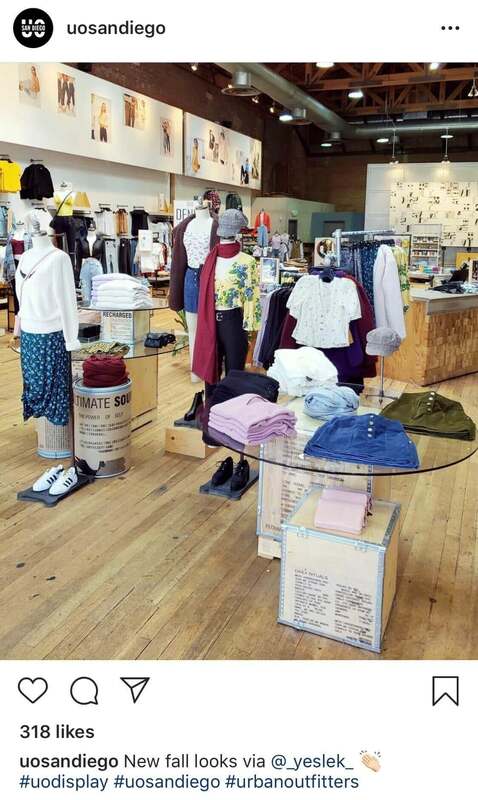 Did your store recently get a makeover? Did you update the menu or extend your hours? Share this! This type of content may not always be the most exciting for the consumer but it can remind them to visit your location. One great example of this is Urban Outfitters. Every time they update the entrance of one of their storefronts with a new product line they share it on social media. This entices shoppers to visit the store to check out the new products. Creating and sharing local content doesn’t have to be hard. In fact, if you focus the majority of your content strategy on creating local content, you can repurpose the content for your national strategy. Need help publishing your new local content to your social media pages, listings, or local pages? 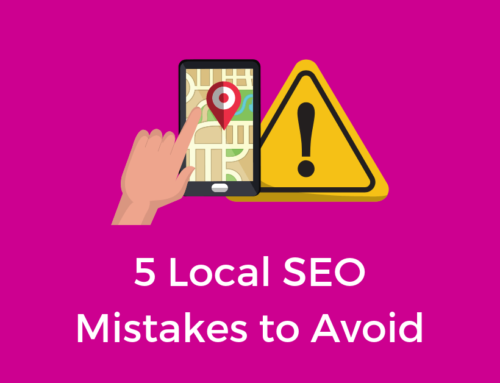 See how improving your local content strategy can help improve your Local SEO, try our free instant brand audit to learn more.